In August 1902, the Czech-born, German-language poet Rainer Maria Rilke arrived in Paris for the first time. Lately come from the tranquil Worpswede artist colony in northern Germany, the hypersensitive Rilke was nearly overwhelmed by the deluge of urban life—"The crowds of people reminded him of beetles, crawling through garbage, scurrying to survive beneath the giant footsteps of life." But nothing would deter him from meeting the world-renowned sculptor Auguste Rodin, an artist whose devotion to his work was so complete that for him "the whole sky was but a stone." Rachel Corbett's You Must Change Your Life: The Story of Rainer Maria Rilke and Auguste Rodin explores the relationship between these two artists, whose lives and work straddle the nineteenth and twentieth centuries. That they had a relationship at all may be surprising, given the vast differences in their artistic visions: Rodin earthly and sensual, Rilke sublimely transcendent. Yet in Rilke, Rodin found a disciple to teach the deep artistic truths of architecture and sculpture, and who could sublimate his earthly creations into exultant prose (though Corbett notes that Rilke's monograph about Rodin "reveals as much about its author as it does its subject"). And in Rodin, Rilke found an exemplar of artistic devotion, one who made an "ascetic covenant … [that] sacrificed luxury and material pleasures for the preeminence of his art," practices Rilke modeled, then transformed and transcended, becoming one of the major poets of the twentieth century. 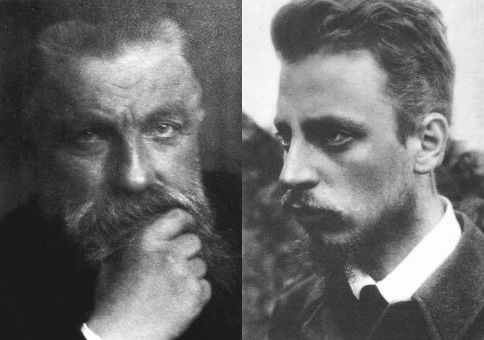 Although their principle interaction spanned just three years, when Rilke researched the monograph about Rodin and then served as his secretary, the two men wove together like earthly phenomena: "if Rodin was a mountain, Rilke was the mist encircling it." Corbett begins with Rodin's impoverished childhood in Beauvais and his formative education in the Petite École, "the working-class counterpart to the more prestigious Grande École des Beaux-Arts," which taught Rodin to "travaille, travaille, travaille" (work, work, work) and inculcated a strong anti-establishment tendency in his aesthetics. She charts his many romantic affairs, his surge to artistic acclaim, and his decline into an old age beset by anxieties about death and artistic irrelevance. Yet she also gives us the portrait of an artist who spent his time in boarding school staring at the Cathedral Saint-Pierre in Beauvais, "his true education," and who came to revere the Chartres Cathedral as "a masterpiece of light and shadow that could have taught Rembrandt everything he knew about chiaroscuro." Corbett also examines Rilke's upbringing in Prague, noting the identity conflicts caused by his socially pretentious mother who, mourning the loss of her first daughter, dressed and treated young "Rene" as a girl for the first years of his life and insisted that he learn German, not his native Czech, the language of the servant class. Corbett explains the paradox of human intimacy that troubled this impassioned poet throughout his life: "If learning demands solitude, then learning to love also required doing so without other people." And she shows how utterly devoted he was to his art; seeking to render the ‘thingliness' of the world in his poems, he spent long periods at the Parisian zoos, studying the caged animals like objects "the way Rodin looked at sculptures upon pedestals." The cash-strapped Rilke came to Paris in 1902 ostensibly to write a monograph about Rodin and to solicit criticism for his wife Clara Westhoff (whose own artistic sacrifices on behalf Rilke are documented by Corbett). In truth, Rilke was a disciple in search of his spiritual master, and Rodin was pleased to have such a follower. Corbett writes, "On the best days, the master invited him [Rilke] to Meudon in the mornings. Rilke would come prepared with a list of questions and they would sit by the pond or take a walk, their discussions often carrying on well into the afternoon. Rodin enjoyed coining new metaphors for his disciple and Rilke dutifully scribbled them down, like a pigeon pecking at crumbs." Such ironic observations are threaded throughout the book, and they represent Corbett's gentle way of critiquing two artists whose appetites, pretensions, and cosmic self-centeredness have been derided by contemporaries and posterity alike. Responding to Rilke's claim in a letter to the artist Paula Becker that "the highest task of the union of two people [is] that each one should keep watch over the solitude of the other," Corbett writes, "Becker surrendered. No matter how self-serving Rilke's rhetoric was, one could hardly compete with it when rendered this majestically." Describing Rodin's studio in the Meudon suburb of Paris, she writes, "By 1905, Rodin’s studio in Paris was starting to look more like a brothel than a workshop. While many poorer artists had to content themselves with using their wives as models, Rodin could now afford to hire women to pose for him at all times, whether he had use for them or not. At any given time a model might be stretched out on a pedestal, while another undressed behind a screen. Others just traipsed around looking bored." Studio 54 avant la lettre! Corbett proves a clear-eyed explicator of both sculpture and poem, unburdened either by jargon or lusciousness. Of Rodin's first famous bust, the Man with the Broken Nose, Corbett notes that it was modeled after an "elderly Greek handyman known as Bibi" whose "terribly hideous" face Rodin sculpted "one pit and furrow after another into a bust, treading across the clay as heavily as life had tread across Bibi." Of Rilke's sonnet "The Panther," his first dinggedicht ("thing-poem") inspired by Rodin's sculptural techniques, Corbett writes, "A reader might be tempted to see the panther's pacing as a reference to Rilke's own artistic plight. Yet there is no poet present here. Rilke no longer draws attention to himself with florid descriptions. He tells us nothing about the panther's size, for example, or the texture of its fur. He instead defines it only in terms of its captivity: It becomes the freedom it does not possess. The ‘passing' bars move, while the animal has become the cage, become thing." Insights into the artistic visions of Rodin and Rilke abound. We learn of their shared fascination with human hands, how for Rilke they were "extensions into the world … a woman reaching for her lover, a child grasping its mother," while for Rodin a hand was "its own landscape, complete and internally resolved. It was not merely a sentence in the narrative of the body, it told its own story in lines and contours that added up like verses of a poem." Writing about the Greek sculpture that inspired Rilke's sonnet "Archaic Torso of Apollo," the source of her book's title, Corbett remarks, "For a metaphysical poet trying to ground himself in the physical world, the body of a god entombed in stone was a fitting metaphor." It is by no means a flawless book. Corbett proves an absent-minded guide, repeating details, skipping around in the chronology, and often forgetting to date key events. This tendency creates distracting gaps in the narrative, as when, in her first reference to the impassioned fights between Rodin and his lover Camille Claudel, Corbett remarks that they were fighting "worse than ever." And since the length of Rilke and Rodin's relationship was relatively brief, Corbett is compelled to fill in the text with biographies and anecdotes about other artists and writers, which one must sometimes labor to connect with Rilke and Rodin. Defects like these make Corbett seem a museum guide so wrapped up in the experience of an artwork that she stumbles through its historical narrative. The aficionado will find such an account endearing; the layperson may not. For the former, however, Corbett is an enjoyable and informed raconteur, and she illumines the inner lives of Rodin and Rilke, exemplars of "all the caged, frail, and hungry-eyed youth who hope to one day raise a timid hand in the air, grasp a tool and strike." Temple Cone is the author of four books of poetry, of which the most recently published is guzzle, from March Street Press. He has also published six poetry chapbooks, as well as reference works on Cormac McCarthy's The Road, Walt Whitman, and 20th-Century American Poetry. He is a professor of English at the U.S. Naval Academy.